More features - Software that does amazing things! We wanted AppPack handle the simplest of things, and some of the bigger things too. Imagine you wanted to build your own app. What would you want your app to do? Would you include your contact info? Let people connect with you on social sites? Let prospects see a picture of you? Do you want your app to be small and not take up much space? Do you want clients to be able to install "you" fast and easily? Would you give prospects a calculator to use? Would you want to give them other apps and tools too? Would you want people to be able to share it? Would it be shared just one way or multiple ways? What about including a video? Or multiple videos? How about having PDF's built-in? What about any forms that can be downloaded or filled in online? How about websites that prospects should visited? Would you want to include a voice recording of something educational? How about adding your company information? What about including your own bio/expertise section? How about broadcasting to everyone automatically? What about wanting statistical feedback? How about cross promoting your professional partners? How about your professional partners cross promoting you? What about the ability to edit right from your phone? If you wanted any or all of the above, AppPack can deliver all this and still more! AppPack can do nearly anything you'd want with an app. A "Pack", much like an "app" has multiple sections. Here is an exploded view of a Pack. You'll be able to personalize yours. 4 Feature: Built In sharing. 5 Feature: Your updates push out to everyone automatically. 6 Feature: Fast Scan. Offline Scan. Bulk Scan. Benefit: Your first pack is can talk about your general expertise, but you can then make multiple packs that focus on a specialty, such as 203K or USDA. Since people need mortgage information, we think the LO should be the one they get it from! Benefit: Have your own reserved code that is easy to remember, and share. It can be a word, or a license number. For example, a Loan Officer, could chose their NMLS ID as a reserved vanity code. It would look something like: http://appk.me/123456 Then you can add add your custom link to your email signature for easy reference. Benefit: QR codes make it fun, interesting and convenient to share information on marketing materials. Up until now, QR codes mostly have been used just to link to a website or a business card. Our QR codes, do something new and do it fast. When scanning AppPack branded QR codes with AppPack, it automatically pulls the information down to your smart phone in seconds. It's stored safely, and automatically updates. Benefit: No matter the situation, you can share your AppPack with your information quickly. If a customer or prospects needs info, just open the app, click share, and send them your pack through email, Text Message, Facebook, Twitter, Word of mouth, Phone-to-phone scanning, NFC Bump/Tap, LinkedIn, Google Plus and more. We even have special key chain tags, stickers, business cards, and name tags that carry your AppPack. And its just as easy to have a customer get AppPack free from the app stores, and type in "YOUR NMLS ID" or Vanity Code. Feature: Your updates push out to everyone automatically. Benefit: When you need to change something, a phone number, street adress, email address, website, article, video, PDF etc, you won't need to redistribute anything. Just update, and everyone automatically has the most recent changes. If you refer clients to your AppPack, they'll have up to date information, plus you'll save time not having to email them repetitively. Feature: Fast Scan. Offline Scan. Bulk Scan. Benefit: Less than 3 second scans - The faster it can be done, the less pain anyone feels. We're the fastest, and we can prove it. Offline scan means no internet is needed to scan. Just scan an AppPack branded QR code and it will queue itself to auto download when internet is available. No waiting! - Bulk scan means you can leave your scanner on, and scan multiple AppPack branded QR codes one after the other and they will all download when you hit done. Benefit: Save money, save time and make a bigger impact. With nearly 2 million apps in the app stores, you don't need to recreate apps that already exist, plus they are expensive and time consuming to design and maintain. 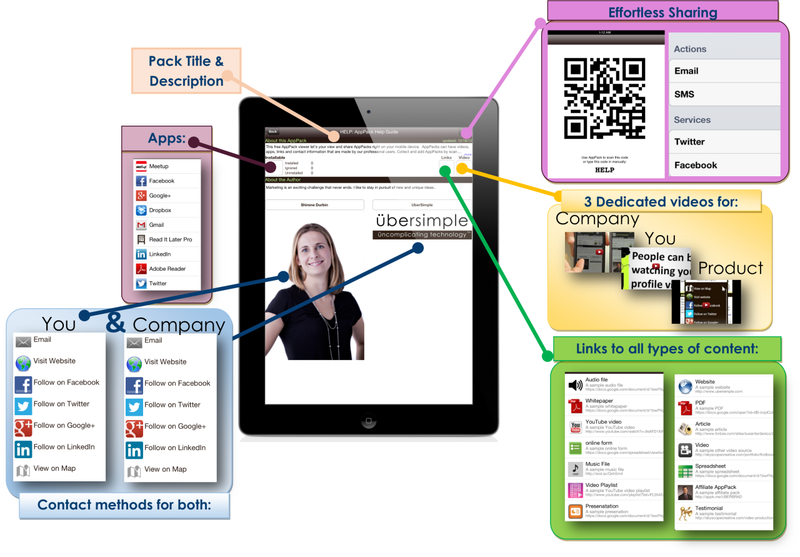 Add the names of apps that you use, or your clients can use and link them in your Pack. Each client will still have the choice to install and purchase if necessary. You simply use your years of experience to recommend tools new clients wouldn't be aware of. Benefit: With the unique look and feel of our specially made QR codes, people everywhere know they are getting something useful when scanning. AppPack makes it fast, easy, and safe to scan AppPacks only. This avoids the "take me to your website" syndrome. AppPacks have a website that first time users will see, or if it's ever needed to be seen from a laptop. After that, people will know an AppPack QR code from a distance, and know its a pack filled with info from a high quality professional.